While I am more than happy to have a few of these cards in different conditions, this example makes me sad, and not because of the many pinholes. It was on this day, 36 years ago, that the baseball world lost one of its finest players. Clemente died on December 31, 1972, in an airplane accident while helping earthquake victims in Nicaragua. While I did not get this cards from its wax pack, I can only imagine the feelings its original owner felt after opening that pack and getting the recently-departed superstar. Happy and sad, I guess. "Nolan hurled 4th no-hitter of career, 6-1-75. Fanned side on 9 pitches twice. Had 19 K's in one game." This is a nice card of a great pitcher in the prime of his career. This Topps issue is starting to grow on me. What's your favorite card from 1976? This is a pretty good one. This card has all the makings of a poor old baseball card. There are plenty of creases, some staining and what even appears to be pencil marks. It even has a little glue on the back. Oh, and it's off center. But what a great card to have. 1961 was a banner year for Roger Maris as he would overtake Babe Ruth as the single-season home run king. 1960 wasn't such a bad year either: Maris was the AL's MVP that year, his first with the Yankees. This is another old tobacco card from the early 1900s, except this issue was of teams only. Sixteen teams were released, eight National League, and eight American League. If you look close enough you will see photos of three significant players for the Red Sox including: Tris Speaker, Harry Hooper and Joe Wood. These cards are printed on a very glosssy, yet very thin, photo paper. As you can tell by this card's edges, it has become very brittle over the years. Years ago I owned a T200 Pittsburgh Pirates card. Obviously it included Honus Wagner. I thought it was great to own a card of Wagner but his image was tiny. So I sold the card and promptly bought another Wagner card. No, not that Wagner card. I actually got an E95. It is a gum and candy card from 1909. It's not the Wagner, but a nice one nonetheless. It's also a poor old baseball card. Those of you who visit this blog regularly may have noticed that I try and post a variety of classic cards from 1952 Topps, to vintage Bowman, to Goudeys, to early tobacco and gum cards. I've even posted some not-so-familiar cards like Dan Dee and Red Heart. I've posted original cards of players like Babe Ruth, Ty Cobb, Mickey Mantle, Ted Williams, Willie Mays, Roberto Clemente and Jackie Robinson. While Fernando Valenzuela was a fine ballplayer, in no way can this be considered a classic baseball card. 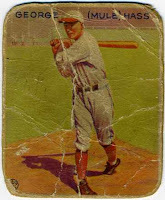 This, however, is a card produced during what I consider the hobby's dark days: Bad quality + tons of stock = bad baseball cards. I recently re-discovered this card in a box full of oddball cards from the 80s. What a bunch of junk! I not sure what it's worth. I might have to pay someone just to take it off my hands. Before you get too excited, that last sentence was not meant to be taken literally. I just don't see anyone retiring on baseball cards from the 1980s. But maybe it's not about worth, maybe it's about the memories theses small pieces of cardboard provide. One man's piece of junk is another man's treasured memory. Whenever I think of Willie Mays, this is the vision I see. Not today's Willie Mays, but a young Mays who was at his peak. Growing up, I was a baseball numbers geek. And while I memorized the baseball history book, I was more than impressed with Willie Mays. Next to Babe Ruth, I think he is the greatest all-around baseball player of all time. I'd even rank him above Mickey Mantle, Honus Wagner and Ty Cobb. Too bad he had to associate himself with a certain Godson who played in the City by the Bay. I got my first 1933 Goudey in the early-1980s. It was of Phil Collins. Not the "Sussudio" guy. This Phil Collins was a pitcher with the Philadelphia Phillies. To me the card was old. I was amazed that, at the time, I owned a baseball card that was 50 years old. I have more than a few Goudeys today, and this is one of my favorites. As a member of the Philadelphia Athletics, Mule Haas played a big part in the 1929 World Series. He sparked his team to a win in Game 4 after hitting an inside-the-park homer in the seventh inning. The Athletics went on to score ten runs that inning, beating the Chicago Cubs 10-8. He hit another homer in Game 5, as the Athletics won the series. This Goudey is one of those that doesn't include the red bar along the bottom advertising Big League Chewing Gum. Something about the missing bar makes it look weird. But it's a real Goudey nonetheless. Oh, and by the way, Mule's real name was George. Boy, does that uniform bring back old memories. I don't remember watching Oscar play in old San Diego Stadium (I'm sure I did see him but I was only nine years-old at the time) but I do remember the likes of Ozzie Smith and Dave Winfield wearing the old mustard and brown. I still have my old giveaway hat from the 1978 All-Star season. I remember the folks at the stadium opening the gates the day before the All-Star Game and fans being able to watch batting practice. If I'm not mistaken, this event became the forerunner to today's Home Run Derby. Speaking of cool, check out that hair. When I got this card years ago I first thought, hey it's a 1952 Topps. Then I thought, hey it's autographed. But who is Gus Niarhos? I often wonder if the signature is authentic. But then I catch myself and ask: Who would fake Gus Niarhos' autograph? The bottom line is that it is a nice old vintage card from the classic 1952 set. Enough said. Topps sure did like to stick that big giant trophy on their cards in the 1960s and 70s, didn't they? Davis was a two-time batting champ (1962, 63) and was the National League RBI leader in 1962. But my favorite factoid about Tommy Davis is that he played on 11 different teams in a ten-year stretch. Beginning in 1967, Davis played for the New York Mets, Chicago White Sox, Seattle Pilots, Houston Astros, Oakland Athletics, Chicago Cubs, Oakland Athletics (again), Chicago Cubs (again), Baltimore Orioles, California Angels and Kansas City Royals. After being released by the Orioles in Spring Training in 1976, he signed with the New York Yankees, but never played for them. That would have made it 12, but I guess it really doesn't count. All-in-all, Davis did play for 12 teams, counting his first seven seasons with the Los Angeles Dodgers – his first eight seasons if you count the one game he played in 1959. Johnny Evers played in 18 major league seasons and compiled a .270 average with 1,659 hits, 538 RBI and 12 homers. Those are career numbers. Yet he was elected into the National Baseball Hall of Fame in 1946. I wonder if Evers' election was more of a reaction to being the second baseman in the famous Tinkers to Evers to Chance double-play combination? I found this card on eBay and was fascinated by its history. The previous owner said that the cards' damage is, in part, a result of Hurricane Katrina. The card came from Mississippi. The card has obvious paper loss and, on further inspection, looks like it has some water damage. A great story for a great card of a fair player who happens to be in the hall of fame. Larry Bowa played 16 season in the Major Leagues, the majority of those years right in the middle of my childhood. And as I remember, he was a pretty good player. Wikipedia seems to back me up: Bowa was a two-time Gold Glove Award winner and a five-time All Star. I think that counts as pretty good. And remember, part of his career overlapped that of one of the greater shortstops, Ozzie Smith. His 1971 Topps card is pretty good too. Not quite Thurman Munson's card but a nice one nonetheless. And Hey, it has the giant trophy. Again, lots of problems with this card of the great Yankee. This is the latest of the 1954 Red Heart cards I've purchased over the last few weeks. This is my sixth Red Heart overall. Only 27 more to go. You see, I'm trying to complete the set and I know it's not going to be easy or cheap. 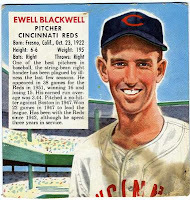 You can follow my progress at my new site: 1954 Red Heart Baseball Cards. You too can watch as I slowly build this set and drain my wallet at the same time. These cards came in small tins which included small mint or violet gum. I'm not sure what violet gum is, but I think it refers to the color of the small round gum pieces. I assume the mint chips were green while the violet chips were purple. 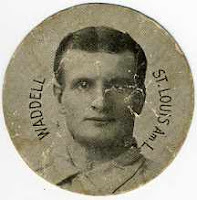 In my opinion, Rube Waddell was one of the premier pitchers of the late 1800s and early 1900s. It was well documented in the Ken Burns' "Baseball" documentary that Waddell was an odd fellow. He is said to have left the dugout, on occasion, to chase a firetrucks as they passed along the ballpark. Whether his actions were a reaction to alcohol, or whether he was just a little off, or whether he had some sort of mental illness, there's no arguing Waddell's numbers. He ranks tenth all-time in career ERA with a 2.16. In 1946 he was elected into the National Baseball Hall of Fame. Here's a great card, with a great pose, of a great player. Sandy Koufax had a pretty good year in 1962 leading the league with a 2.54 ERA. He also had 14 wins and 7 losses. Oh, and he pitched a no-hitter. I'm not sure where I got this card, but it's been in my collection for years. It was the first Koufax I ever had. Does it look like he's wearing a jacket under that jersey? I feel hot just looking at him. Gotta go turn on the air conditioner. This card has several issues. First, it's missing its bottom tab. And second, it's got some sort of staining in the bottom right corner. These cards were issued with Red Man Tobacco and included a tab along their bottom which were intended to be cut off and sent in for a premium. Obviously this one is missing. I hope the bottom stain is something like soda or coffee and not tobacco juice. This card, for all its flaws, does have beautiful artwork. In 19 major league seasons, Stuffy McInnis hit .307 with 2,405 hits and 1,063 RBI. But McInnis is probably best known as being a member of Connie Mack's $100,000 infield with the Philadelphia Athletics. McInnis played first base while Eddie Collins played second, Frank"Home Run" Baker third, and Jack Barry shortstop. $100,000 was a ton of money in 1909. McInnis was also a member of the World Champion Boston Red Sox in 1918. This card was distributed with American Caramels in 1921. While the back of the card says that 80 players appear in this set, there were actually a bunch more. I wonder how the A's payroll of the early 1910s translates into today's money. Somehow I don't think they would get close to the money paid to the left side of the Yankees infield. Heck, Alex Rodriguez and Derek Jeter alone make nearly $50 million dollars between the two of them. From what I know, this card was given out in Oakland, Calif., at area Signal Gasoline stations. The set consists of 24 cards of Oakland Oaks players — including Charles "Casey" Stengel. Gassaway played in parts of three major league seasons with the Chicago Cubs, Philadelphia Athletics and Cleveland Indians. He went 5-9 with a 4.04 ERA in the three years. One interesting thing about this card is that it is very thin, not much thicker than a business card. It's a cool regional card from the old Pacific Coast League. Over the past couple of months I've posted baseball cards that could have been found on cereal boxes, in cereal boxes, on boxes of Twinkies, in bags of potato chips and various other places. This card would have been found with dog food. My understanding is that if you would mail in a couple of labels of Red Heart dog food and ten cents, you could receive one of three subsets (11 cards) of this issue. A total of three subsets were made for a total of 33 cards. Each subset was differentiated by its background color. Cards either came with a green, blue or red background. One interesting thing is that in 1954, Cardinals star Stan Musial appeared in this set but not in the popular Topps and Bowman sets. Mickey Mantle also appears here while not appearing with Topps. Red Heart did a nice job making a simple and attractive issue. With Dan Dee, Red Heart provided at least some competition in 1954 to the big two gum companies of Topps and Bowman. Here's another one of those Post Cereal cards that was cut off the back of a cereal box. I really like these old cards and they are good way to get players who would otherwise cost a bundle. Guys like Mickey Mantle, Willie Mays, Hank Aaron, Roger Maris, Roberto Clemente and Yogi Berra all appeared on these cards. I think this card cost me about six bucks. I wonder if Yogi's cards are becoming more popular as he appears more and more on TV. I bet most kids today think he is that guy who is in all those insurance commercials with that duck, rather than one of the best catchers of all time. I really like Yogi, I think his contributions to the game are way underestimated. Of the nearly 50 posts on this blog, this is the first of the man many consider to be the real home run king. By the end of the 1973 season, Hank Aaron finished with 713 career homers, one shy of Babe Ruth's career record. He would eventually break the record on April 8, 1974, and ended his career with 755 homers. Aaron never hit 70 homers in a season. He never hit 60, or even 50 homers in a season. But he did have 23 great season, averaging more than 32 home runs each year. Not bad for the real king. If any card set was made for this blog, this is the one. In 1954, Dan Dees were issued in bags of potato chips. And while Topps cards have a chance of being stained by gum, Dan Dees were almost always stained by those oily potato chips. One card was issued per bag. And while it rolled around with the greasy chips, it picked up a few corner dings along the way. Therefore, it is almost impossible to find one of these old cards in mint condition. This example has more problems than a few stains and corner dings. This card has more creases than I can count. But isn't it a great card anyway? As of this posting, this is the only Dan Dee in my collection. One down, only 28 more to go. I just got back from the local baseball card show and this is one of the cards I found. In the middle of all the autograph, relic and refractor cards was an older couple who had some of these old Wheaties panels. I'm not really sure if I can call them cards because they are huge. Originally, theses panels would be cut off the side of the cereal box. And from what I understand they practically took up the entire back of the box. 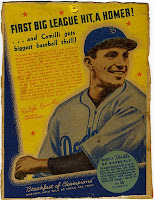 This example is numbered No.16 of a series of 16 and is of Dolph Camilli, the Brooklyn Dodgers entry in the set. Each team, there were only 16 in 1938, had a player represented. I was really surprised to see this type of card at a local 20-table show. I usually have to go to a regional-type show to find this sort of thing. I was also surprised to see quite a few vintage cards. I even found a few poor old baseball cards. Stay tuned, I'll be posting them in the coming weeks.